Today we will discuss the issues on charging or charging Apple iPhone 5s , charging or charging problems often experienced by all cell phone brands in this world, this problem would make the dead lice or mobile phone users gadgets. Damage to the charging iPhone 5s usually occurs because the plugins that have been damaged. Here are the steps to solve charging problem. The first step that should be done is to replace the charger plug or the charger connector, usually damage to the pin or needle in the charger plug. If after replacing the plugin does not solve the problem. Try the next step. 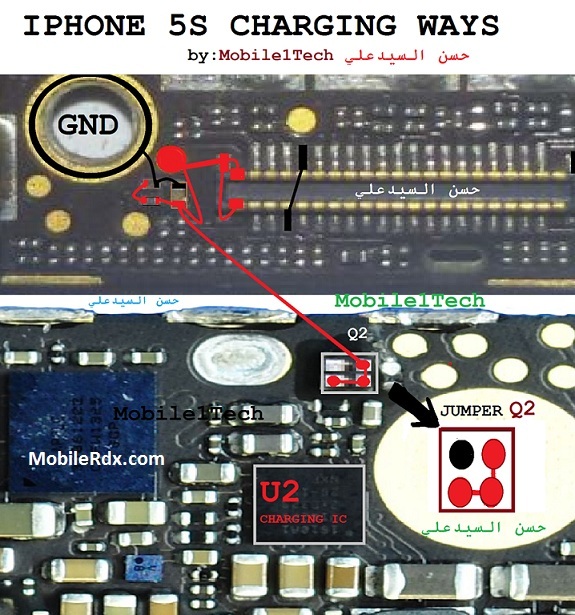 The second step checks charger lines as in the picture below, if there is a path-breaking try to do the jumper. Your charger might be faulty. If same problem replace charging connector and check.